NASA has paid tribute to the victims of the September 11, 2001 attacks, sending American flags to Earth orbit and to the surface of Mars. Ten years after the September 11 terrorist attacks, tributes to the thousands who lost their lives have extended into space, from Earth's orbit to the surface of Mars. Mementos were carried into space for the families of the victims, flags were flown as memorials to the fallen first responders and metal recovered from Ground Zero, the site of the World Trade Center buildings in New York, was incorporated into rovers sent to explore the Red Planet. American astronauts have also radioed down from space their own tributes, starting the day of the attacks to this week, pausing to remember those who died on the tenth anniversary of their loss. "We also want to remember the sacrifices made by the first responders who ignored the dangers and ran toward the destruction and the devastation that was visible even from here, the International Space Station by commander Frank Culbertson and the crew of Expedition 3," Fossum said. One of a series of pictures of metropolitan New York City taken by one of the Expedition Three crew members onboard the International Space Station (ISS) at various times during the day on September 11, 2001. A smoke plume rises from the Manhattan area where the World Trade Center was destroyed. The orbital outpost was flying at an altitude of approximately 250 miles. Culbertson, who was the only American in space on Sept. 11, 2001, reported that day that he could see smoke rising from where the World Trade Center buildings had stood. "We flew past New York City and saw the effects of that attack on that city," he said. "Playing taps gave me a sense of connection with Chic. It was a terrible loss, but I'm sure Chic fought bravely to the end. And tears don't flow the same in space," Culbertson later wrote. 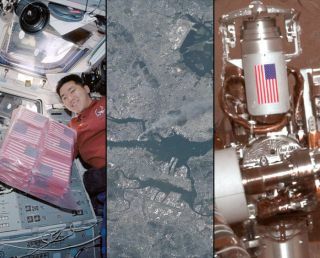 In addition to sharing their thoughts, astronauts have also carried thousands of flags into space in honor of the 9-11 victims, including the loss of one of their own. Four months after the attacks, space shuttle Endeavour launched to the station on a mission to bring Culbertson and his Russian crewmates home. On board the orbiter was a flag recovered from the World Trade Center site and almost 6,000 small U.S. flags that were flown as part of NASA's "Flags for Heroes and Families" campaign. "The 'Flags for Heroes and Families' campaign is a way for us to honor and show our support for the thousands of brave men and women who have selflessly contributed to the relief and recovery efforts," then-NASA Administrator Daniel Goldin said. "NASA wanted to come up with an appropriate tribute to the people who lost their lives in the tragic events of Sept. 11," he said. "America's space program has a long history of carrying items into space to commemorate historic events, acts of courage, and dramatic achievements. 'Flags for Heroes and Families' is a natural extension of this ongoing outreach project." Among the victims was Charles "Chuck" Jones, a retired Air Force officer who trained for a Department of Defense dedicated shuttle mission that was canceled in the wake of the January 1986 loss of shuttle Challenger. Jones was a passenger aboard American Airlines Flight 11 when it was piloted by hijackers into the north tower of the World Trade Center. On National Flag Day, June 14, 2002, NASA began the distribution of the flags, which were mounted on memorial certificates. They were given to the survivors and families of the victims in New York and the Pentagon, and to the families of the heroes killed on United Airlines flight 93 that crashed in Pennsylvania. At a ceremony held that day in New York City, Culbertson helped present the Ground Zero-recovered flown flag to then-New York Governor George Pataki. "This precious flag symbolizes the sacrifice and courage of the thousands of New Yorkers and Americans who perished that fateful day. On behalf of all New Yorkers, I am proud to welcome the flag back to the New York City to honor the innocent men and women who were working in the towers on September 11, and the countless heroes whose spirit and strength has helped carry us through this horrific ordeal," Pataki said. This year, NASA continued its tributes to September 11 with two flag-related activities. In February, flags flown at the Kennedy Space Center in Florida were used to help mend the damaged remains of "The National 9/11 Flag," which was hanging on a scaffolding across the street from the World Trade Center when the south tower collapsed. NASA launched two more 9-11-connected flags but unlike the others they won't be returning to Earth. The twin Mars Exploration Rovers Spirit and Opportunity, which landed on the Red Planet in 2004, each have a U.S. flag-adorned component that was cut from debris from the fallen towers. An aluminum cuff serving as a cable shield on each of the rovers' rock abrasion tools was constructed from material recovered from the destroyed World Trade Center. "It's gratifying knowing that a piece of the World Trade Center is up there on Mars," Stephen Gorevan, founder and chairman of Honeybee Robotics that built the rovers' rock abrasion tools, said. "That shield on Mars, to me, contrasts the destructive nature of the attackers with the ingenuity and hopeful attitude of Americans." An early hurdle to the idea was acquiring an appropriate piece of material from Ground Zero. Through Gorevan's contacts, a parcel was delivered to Honeybee from the New York mayor's office on Dec. 1, 2001, with a twisted plate of aluminum inside and a note: "Here is debris from Tower 1 and Tower 2." The shields were produced and launched without fanfare. Neither Honeybee Robotics nor NASA spoke of the tribute until after the rovers were on Mars. "It was meant to be a quiet tribute," Gorevan told the New York Times in November 2004. "Enough time has passed. We want the families to know."